An elegant lightbox overlay shows your Youtube or Vimeo videos. Display the content in XXI century – show the tutorials, advertising, reviews and at least your team – Video Pop Up for WordPress. PopUp by Supsystic makes your WordPress page or blog stylish and increase the level of the customers’ condescension. Pop Up Video is the best for people who like changes and change. The modern customer doesn’t like to read, he likes to watch. The videoclick generation better and often click on the video, but do not read the text. So marketing also makes this step forward and today lots of owners use Video Popups on their WordPress sites and pages. 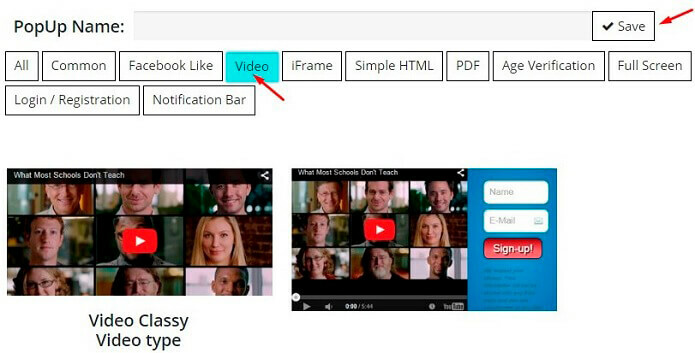 WordPress Video PopUp by Supsystic – this is a theme of the whole plugin dedicated to Popups of all kinds, that allows users to create popup videos in two steps that appear after clicking an element on the page. This could be an image, link, or whatever you want! These videos can be youtube or vimeo videos. Shortcodes included makes this easy to accomplish. Choose Popup by Supsystic on your admin panel of the WordPress admin page. Click the insert “Add New PopUp” and choose there Video theme! You have two variations: the classy one and the list. Choose the ever you want. Type the name of your future Video PopUp and click the button “Save”. Don’t forget that any time you want, you can change literally everything in your Popup – from the size of your pictures to the name of it, background, the time for showing or any other info you need. Special for this need you have inserts Main, Design, Subscribe, A/B Testing, Statistics and even CSS/HTML code for the most experienced users. So you have all the sides for changing and even can see the result of your efforts before installing it into your live site. The button “Preview” helps you with this. We did a great job only for you, we looked at the popup plugins that were out there already, we saw that they were either too complicated to set up, or that they didn’t have the functionality that we were looking for. So we decided to code our own! The PopUp by Supsystic includes all you need: easy installing, intuitive understandable interface and challenging design. Make the site better than it was before with WordPress plugin Popup!